The concept behind the Corey Weber's Agent 47 Mustang is fairly straightforward- build a car that is streel legal, that can be transformed into a track-ready race car in NASA's American Iron Series on an hour's notice. Race wheels and tires are swapped out, door bars unbolt, race seats get swapped out, the front and rear aero packages are removed, street trim is put on and the engine's race tune is changed over to a street-friendly tune. Sounds good to us! What's even cooler about this Mustang is that over 40 parts on it were build using 3D printing. Corey tells us the majority of 3D parts are not able to handle the temperatures and abuse that cars require, but he believes he has found a viable alternative with the folks from Forecast3D. Corey tells us Forecast 3D's large collection of large platform, industrial grade fused deposition modeling 3D printing machines use the same plastics that are used in OEM production. We're talking ABS, polycarbonate and even the exotic stuff, like ultem and polyphenylsufone, which are even stronger and have higher heat resistance. This technology allows Agent 47 to design a part, send it over to Forecast3D and have either the part or a mold for the part turned around in very short order at a reasonable price. So enough about the exotic plastics going into this Mustang, let's talk about the heavy metal. For as much high-tech plastics that have gone into this car, much of the rest of the car was built with a function-first mentality. That means no air-conditioning, no ABS or traction control, not even a radio. The chassis on this car was designed by Bill Osborne of Inland Chassis Design, whose name might ring a bell to Pro-Touring history buffs. Bill was involved in the design of the chassis on 2008 OUSCI competitor RJ Gottlieb's Big Red Camaro. We don't know (yet) what kind of engine is under the hood, but Corey tells us it was tuned by ST Motorsports and is good for about 410 horsepower, which he acknowledges will put him at a disadvantage, even with a flyweight of just over 3,000 pounds in street trim. One area where they aren't at a deficit is on their air intake. The Mustang breathes easy thanks to an airbox custom-designed by Corey's crew, along with the folks at KN Filters. The 18-inch Forgeline wheels on the Mustang are custom-designed just for Agent 47 and are available exclusively through them. So how will the Mustang fare in the OUSCI? Weber's extensive race experience in NASA will certainly help him in the BFGoodrich Hot Lap Challenge, although he concedes his autocrossing background is not nearly as expansive. He also notes the lack of power may challenge him in the Wilwood Speed/Stop Challenge. 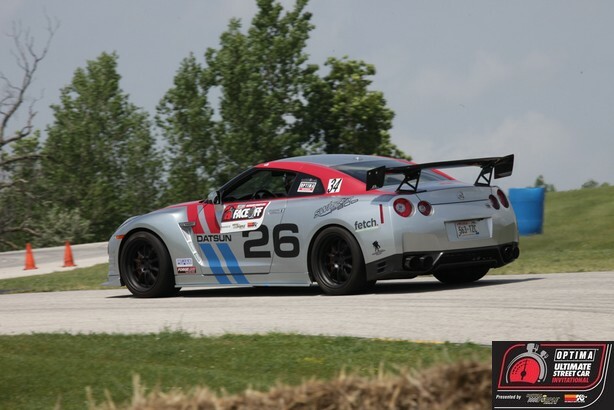 When it comes to the Lingenfelter Performance Design Challenge, Corey believes the judges will really be impressed with the Inland Chassis, although it's track-centric focus may cost it a few points. If you want to see more of the Agent 47 Mustang, check out their website or their YouTube Channel. We can't wait to see it in Pahrump! If any OUSCI tickets are left, you can buy them here.